This pair is nicknamed "Heart and Soul". North is to the Right. Above the right "ventricle" are open clusters NGC 1027 and IC 1824. 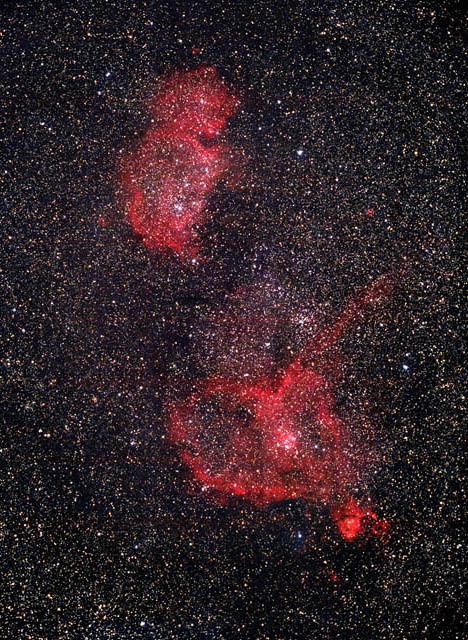 The red nebulae at the lower right of the Heart are NGC 896 and IC 1795. The hi-rez image shows 16th magnitude lenticular galaxy UGCA34 and 15th magnitude spiral galaxy UGCA39 at the center left.